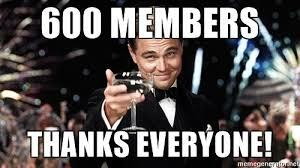 Community Milestone: 600 Members! Wow! We have had a number of community milestones since we launched the community site during the last week of August. Today I am extremely pleased to announce that we have reached 600 users. Of which 585 have been verified as either Smartthings usernames or independent names. The rest are pending verification. With respect to user verifications, I’d like to make everyone aware of how much time and effort @RobinWinbourne has put into this process. He does get some help from the rest of the minions, but he really has taken it heavily upon himself to be engaged in the process. He deserves a lot of credit for his hard work. I’d also like to acknowledge @bangali @c1arkbar and @einars for being so heavily engaged this past month with the community. These guys combined have written nearly 900 reply’s to posts in this past month alone. They are giving their time day after day to help educate and spread understanding of the platform. Bravo gentlemen. I’d also like to acknowledge our members. You all have created one of the most impressively active discussion forums I’ve ever been part of. Some community stats from when the site went live 6 weeks so, to put it in perspective. I hope these stats give everyone an idea of just how engaged this community is. I can’t state this more emphatically, you all make this community something special! 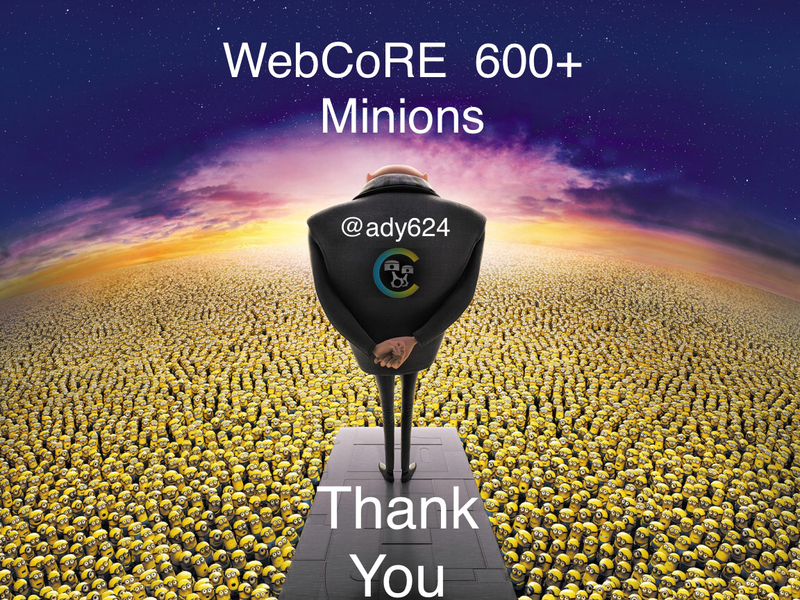 As webCoRE goes, @ady624 is pounding away at his keyboard faster than the minions can keep up with his work. There is a reason he is Gru! If the minions didn’t know better we might suspect he is a 21st century version of Data (Star Trek TNG). I always ask people to like and tag him in these milestone posts to say thanks for all his hard work, and I ask the same this time. Please reply below and tell us how webcore has become an indispensable part of your home. I will be awarding a special badge to the user with the most unique and powerful story on the benefit of webcore. I’d also like to let everyone know, while @ady624 has been hard at work on the webCoRE platform and the new mobile app, @ipaterson has been hard at work on the site. I can’t share much detail yet, but we are going to be putting a new landing page on the community, with quick links to a lot of the most used portions of the community and wiki pages. As well as a series of tutorials that the @webcore_minions are developing. It may be another few weeks or a couple of months, but we are hard at work to improve the webCoRE community and wiki user experience. All things webcore are evolving. And there’s a lot of exciting stuff coming! Stay tuned! Thank you for your incredible participation in the community. This shows that webCoRE community was much needed! @ady624 You truly are the master. Well done on such an achievement WebCoRE is amazing. Outstanding job to everyone! I wish I had more time to be more involved. Thank you so much to all that put their time in this. It’s not easy but it’s definitely not thankless! Awesome Job guys. webCoRE is the glue that holds all my smartthings and semi-smartthings together. I too want to thank @RobinWinbourne as he’s been really awesome at helping me climb the speedbumps that pop up along the way, and @ady624 for this awesome app. As a new (post 600+) member I want to say thanks for such a great ST app and community forum. I previously used Rule Machine and then moved to CoRE when RM deprecated. Earlier this year I heard about Stringify and had been giving it a spin. I found it’s GUI to be interesting, but it never measured up to the power of CoRE. In the last month news came out that Stringify was being purchased by Comcast. I also noticed the progress of Stringify development slow down during this time. I’ve since left the dark side and introduced myself to webCoRE. I must say it’s amazing! As a busy father with two young children, free time is a bit of an oxymoron. Yet I was able to install webCoRE and rebuild all of my Stringify flows as pistons within a couple of days. I’ve got almost 50 pistons running quite well, including ones related to presence/home modes, lighting, comfort (HVAC) and entertainment (turn on/off my TV and receiver via Alexa commands). Looking forward to finding more uses for webCoRE! As a new (post 600+) member I want to say thanks for such a great ST app and community forum. I would like to also say thanks to everyone here for the great work. Awhile back I was debating getting rid of my entire SmartThings environment because it just wasn’t “good enough”. I then stumbled upon CoRE, which led to webCoRE, and now I really enjoy my “smarthome.” Big shout out to @ady624 for making it all possible.